When I visited my friend in England in 2011, she made sure to make me even more obsessed with British comedy (and comedy in general) by introducing me to Tim Minchin's work. She searched to see if he had a show in the area while I was there, and - HE DID! Kind of... he was going to be one of three guests at the Horne Section's show. Neither of us knew who they were, but wanted to see Tim, so we got tickets. The Horne Section cracked us up. They are a band focused on musical comedy, but their banter was so deadpan that I couldn't stop laughing. Alex Horne is very matter-of-fact and everything he says cracks me up. Later that night I tweeted to them about coming to America and even laughed at his reply. 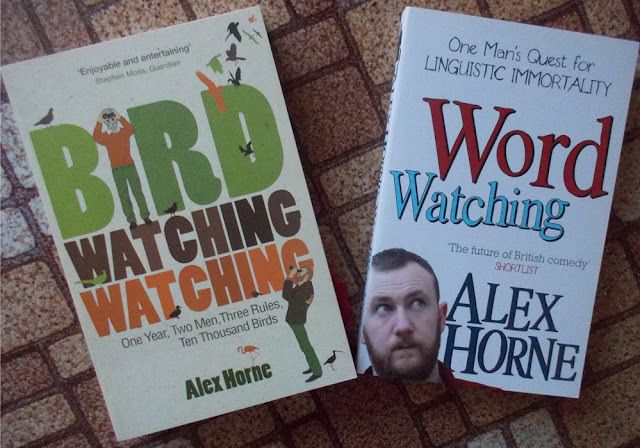 I found Alex Horne's books online not long after I got back to the states, and ordered them right away. And... haven't read them. Isn't that awful?! I don't know why I haven't read them yet, but I think I'm now giving myself the challenge of reading them before May - if I can handle it on top of these daily posts! To inspire me to read these, I've been listening to the Horne Section podcast. It's just as hilarious as I remember the live show being. Check it out if you love comedy, musical comedy, British accents... well, just check it out!